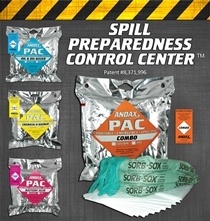 Andax Industries LLC has a new patent on its color-coded Spill Preparedness Control Center (SPCC). The color-coded labeling system of the SPCC ensures the correct Spill Pac will be used every time. This system consists of four Spill Pacs with unique color-coded labeling with matching color-coded equipment labels. Potential leak sources can be identified by placing color-coded labels on equipment before a spill or leak occurs. In the event of a spill, just grab the matching color-coded Pac for the equipment label to have the exact sorbents and pads needed to contain and clean up the spill or leak. The SPCC System includes four vacuum-packed Spill Pacs: The orange Combo Pac, yellow Chemical & Hazmat Pac, blue Oil & Oil-Based Pac and the pink Battery Pac. Each Pac will contain or clean up to a 10 gallon spill.